Get 30% off all web hosting plans. Exclusions apply. Get 40% Off .com and .net domains. Expires on 09/20/2015. 25% OFF for one whole year! 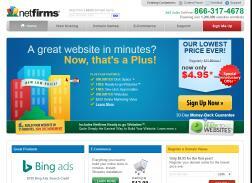 * *Offer applies to new sign-ups and upgrades of Netfirms Advantage web hosting. Get 25% Off New Domain Names, Domain Privacy and more. See Plus plan features and details on site. Quite Simply the Easiest Way to Build Your Website. Choose from dozens of stunning styles by brand name designers. With several style variants available for each design, making it your own has never been easier.